Another big four months — but this is all! In the last chapter of my book A Big Manhattan Year I state that I have no intention of doing another big year. Nevertheless, I have spent nearly all of 2013 near or at the top of the Manhattan eBird leaderboard. I do not expect to stay there. I have put in only 75% of the effort that I did last year, but I have been fortunate to get 95% of the results (meaning that with full effort I would expect to have five to seven more birds). A very strong winter, with rarities from Randall’s Island and the Central Park Reservoir, has partially made up for a dismal spring migration. I will close April 2013 with 129 species; at the same time in 2012 I had 131. The biggest difference was that by then I had a great many rare warblers: Prothonotary, Yellow-throated, Orange-crowned, Kentucky, and Tennessee, along with both of the Central Park sandpipers and Orchard Oriole — none of which I have this year. The birds just have not shown up (except for Yellow-throated Warbler and Orchard Oriole at Inwood Hill Park). I will continue birding — the peak of spring migration should occur over the next two weeks — but I will do it to enjoy one of nature’s grand spectacles and not as a competitive activity. I will dial down the effort level even more, as I have some other projects that deserve greater focus, including marketing my book to a wider audience. Those of you who are going at it competitively this year know that the next few weeks are make-or-break. I closed May last year with 164 birds, and I expect the leader this year to finish May close to this number, as the warblers will eventually come — they are just late. This is no time to sleep in. Be ready to bird five hours per day or more and chase alerts as they occur. Go! Today, April 25, brought more warblers to Central Park, though the only ones in great numbers were Yellow-rumped Warblers, as would be expected. My morning walk had three Black-and-white Warblers (also five Blue-headed Vireos) but otherwise the new warblers that appeared did so singly, or close to it. I saw a male Prairie Warbler twice. The first time was at 8:20 a.m. just west of Azalea Pond. The bird appeared with close to thirty birders nearby (I believe that Joe DiCostanzo spotted it first), and all were treated to close, sunlit views. This was my first Prairie Warbler of the year. I returned to the park for a late-afternoon walk. On a not-too-hot day this can be productive: birders are fewer and migrants can become active again. I found a shady, unoccupied part of the Ramble where I was hearing some songs: Northern Parula and Prairie Warbler. As I was standing there, the male Prairie fluttered down to within ten feet of me and perched low. What a treat! After adding a new life bird for Manhattan yesterday, I was thrilled to add another one today, one that I was not at all expecting to see. There are some birds missing from my life Manhattan list for which I am always on watch, most notably, Common Raven, which can fly over any time and has been appearing more often in Manhattan this year; or Canvasback, or Boat-tailed Grackle. 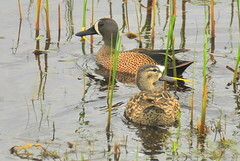 Blue-winged Teal, however, has not been reported on eBird in Manhattan since 2009, even though it appears frequently in Brooklyn and nearby New Jersey (the Meadowlands). I have no idea why these birds avoid Manhattan! I suspect that they occur in flyovers, particularly in the fall, but few birders watch the skies for flyover ducks. There must be at least twenty birds I deemed more likely to join my life list than this one. At 8:25 a.m. today I was scanning the Lake for swallows when I saw a pair of unusual ducks. The male clearly looked like a Blue-winged Teal, or at least like what I recalled a Blue-winged Teal to be from the guidebook — I had never seen one before in the field. I ran to Evodia, where I figured top birding guide Joe DiCostanzo would be with his Museum of Natural History group after encountering him earlier on the way into the park. Joe helped me to confirm the ID with his birding app. Now entirely certain of what I had seen, I sent out an NYNYBIRD alert and led the birders to the shore of the Lake east of and opposite Hernshead. It took a couple minutes, but the pair of teal came into view, swimming together 60 yards offshore near a Gadwall. For nearly everyone this was a life Central Park bird. It was my 225th lifetime Manhattan species. Year birds for me today included Yellow-rumped Warbler, Green Heron, and Blue-headed Vireo. I added a number of good birds since my last post: Blue-gray Gnatcatcher on Sunday the 14th — a tough bird to find early in the season, of which there have been only a few reports so far in Central Park; Northern Rough-winged Swallow, which I had over the Meer on Monday and over the Lake this morning; Snowy Egret, seen from around 93rd Street and the East River among a breeding colony of Great and Snowy Egrets on Mill Rock Island; and, today, Greater Yellowlegs! Credit goes to ace birder Stephen Chang, who appears in my book. He found two Greater Yellowlegs on the Sherman Creek mud flats of Swindler Cove Park in Inwood last evening and posted his sighting on eBird. This morning eBird alerted me to his observation, as the species is one I have not yet observed this year (or ever) in Manhattan. I made many trips to Swindler Cove in the heat of August last year to try to see large shorebirds, but after my initial sighting of a likely Short-billed Dowitcher, no others appeared for me. I was delighted to see this one venture out on the mud flats roughly 20 minutes after my 11:15 a.m. arrival. I then went to Fort Tryon Park to raptor-watch, but I saw only three Turkey Vultures gliding north over the Hudson and two Red-tailed Hawks. For those of you looking at my book, I had to re-submit some digital files. It should be available again within a day or two. 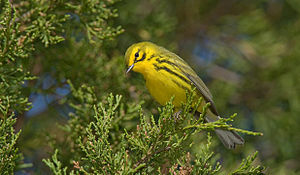 As for spring migration, the warblers have begun arriving. Sunday the 7th brought Louisiana Waterthrush to the Loch in the North End along with Pine Warbler in the Pinetum. I saw my first Pine Warblers today (Monday the 8th). I also had my first-of-season Winter Wren, Palm Warbler (I saw an over-wintering one in January), Chipping Sparrow, and Brown-headed Cowbird today. Greetings, everyone! It has been several months since I have blogged about birding. There are a couple of reasons for this. First, I have been busy writing my book, A Big Manhattan Year, which is now complete and available for purchase. Second, with Starr’s passing in early February I made her site, StarrTrips (where I blogged last year), entirely a memorial to her and decided that it was no longer appropriate to continue writing about my own birding experiences there. Near the end of my book I stated that I had no intention to do another big year anytime soon, and that is still the case. But, despite birding much less than I did last winter, I actually ended up well ahead of last year’s pace. As of this April 3, I had 92 species; last year on the same date I had 85. By tomorrow (April 6), this advantage will be gone. For nearly a month now, New York has had cold weather and predominant northerly winds. The effect on birds is that many early migrants are appearing later than usual — much later than they did last year, when warm conditions brought unusually early arrivals. For example, in 2012 Eastern Phoebe was being observed frequently by March 14 and Pine Warblers arrived on March 10. This year it took until April 1 for the Phoebes to be seen in decent numbers, and Pine Warblers have yet to arrive as of April 5! Last year, the first Palm Warblers appeared on March 29th, and we still have not seen any this year, nor have any warblers at all been reliably reported from Central Park. Golden-crowned Kinglets have been appearing, in good numbers, since March 31, and Northern Flickers are starting to be heard and seen. The park’s water bodies have also been graced by some Great Egrets, which will remain common throughout the spring but are always a delight to see. Two weeks ago I added another “white whale” bird to my lifetime Manhattan list when a very cooperative American Woodcock took up temporary residence in the plant beds of Bryant Park. Warmer weather and southerly winds are on the way. Let’s see what they bring!